Blog Dare - Day 9 - I never get to __________ anymore. Blog dare for day 9 is I never get to _____ anymore. Hmm, ok well I never get to just go out and take a road trip to wherever the road leads me anymore and I so would love to do that, not that I did it that much before but I use to just decide that one weekend I would just go wherever the road led me and enjoy it, sometimes with the kids/family and other times just by myself. I never get to do that anymore although here pretty soon I am hoping to take a trip to Graceland with a friend or two. I would so love to go there and sight see and relax and just walk around and hopefully take tons of pics! 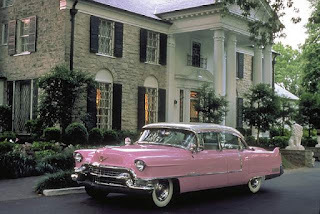 I love Elvis always will and would love to go there. That sounds like a great road trip! When you go take lots of pics and post 'em here so we can all take a road trip to Graceland! Oh I will!! I can't wait..not exact when were going but we will..I am determined to go and will do it and definitely take a ton of pics and will share :) I absolutely love taking pics and vids and knowing us lol we will be stopping every hour or so!! LOL...I love just stopping and taking pics of cool things...I've been getting back into taking pics of the morning, afternoon and evening clouds..they are just so pretty to me and I just love watching them move or just enjoying how blue and pretty they are etc...love it!